Have you ever tried painting with spatulas? Painting is one of the simplest and most engaging activities you can provide your toddler and we love it here at My Bored Toddler. With minimal setup and few materials, it is an easy and fun activity for both kids and grownups. You don’t have to limit the painting experience to regular paint brushes, in fact our 10 ways to paint without a paintbrush post is one of our most popular.Exploring different tools like these kid-sized spatulas offers new sensory and creative opportunities for toddlers. 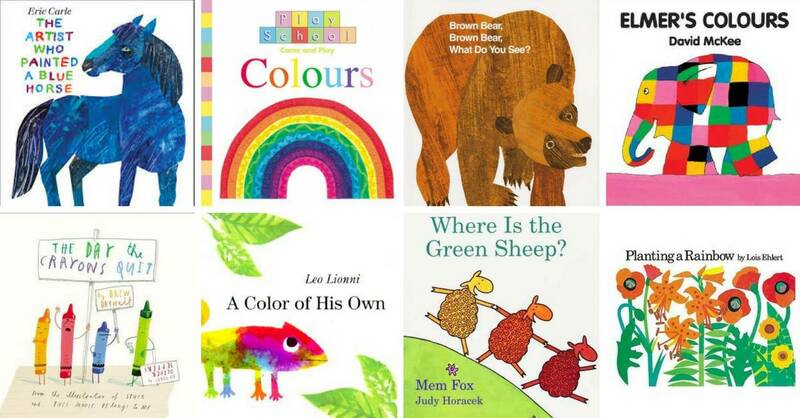 We love to do this activity after reading some of our favorite books about Colors – you can see our favorites here. Washable paint (we love this paint as it always washes off). 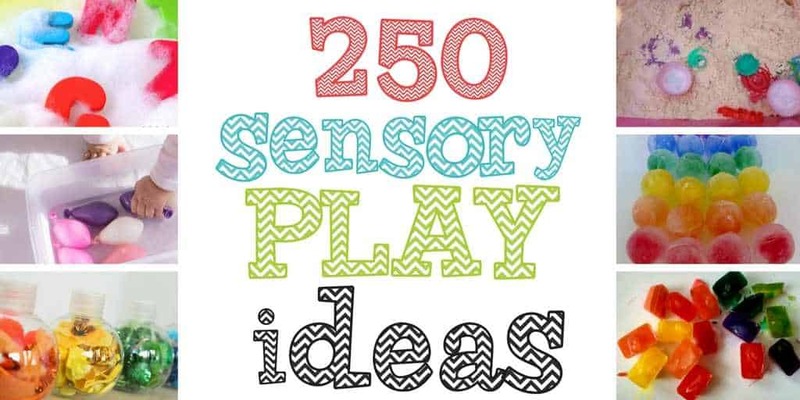 Since fingers and palms are involved in the process be prepared for some mess with paint shirts (we love this Melissa and Doug paint shirt) and hand wipes. Cover the work surface with a drop cloth like this one, or a large piece of cardboard. The paint can be used in two ways, to provide different options for using the paint and spatulas. Pour paint into foam trays. Pour paint directly onto the paper. Press a spatula in the paint tray to coat completely. Press it onto the paper. Kids might like to splat more than tap gently with this process! 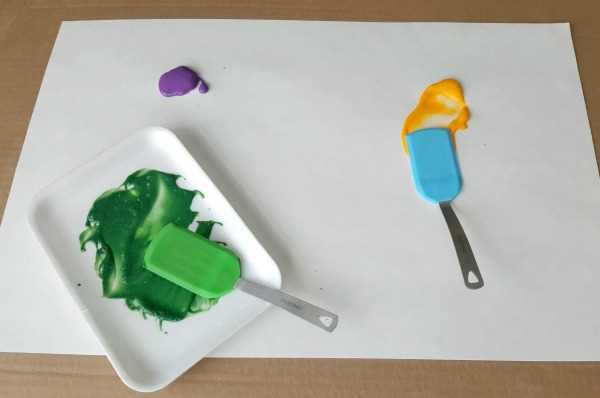 Swipe the end of a spatula through a blob of paint and spread it over the paper. Drag another color through the first one to mix the colors. 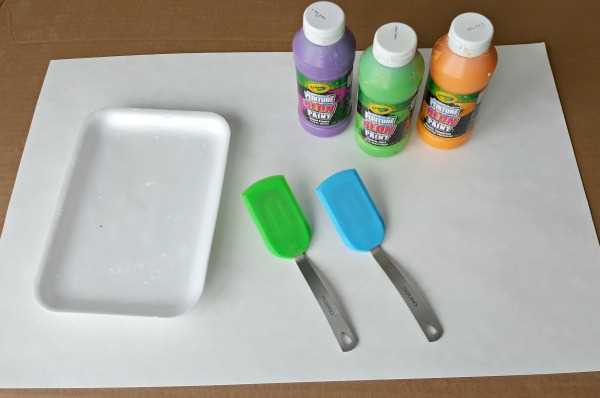 Extend the activity by painting with spatulas on other surfaces such as aluminum foil, colored construction paper, or parchment paper. 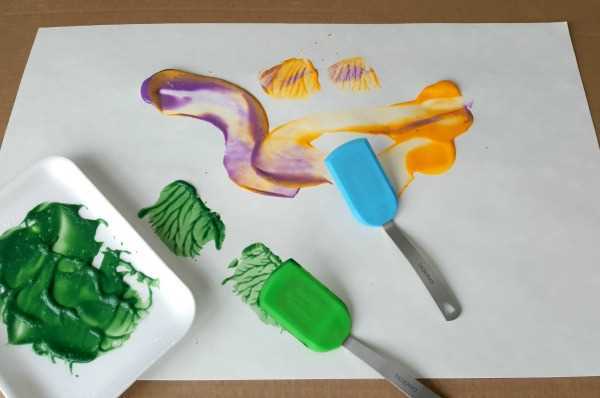 Spatula painting is a fun activity that engages fine motor and sensory skills. It also provides opportunities for recognizing and naming colors, creating shapes and designs, and using words like ‘spatula’ and ‘splat’! The children also observe new colors being created by mixing the paint colors. Process art experiences provide opportunities for kids to experiment and explore materials with little or no instruction. 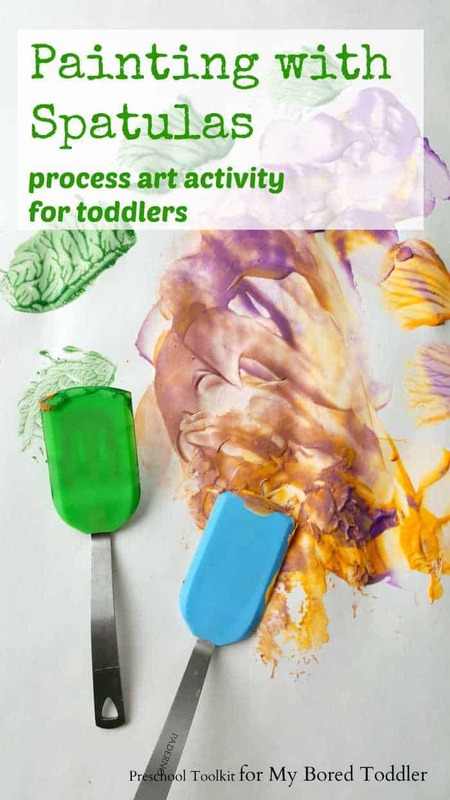 You can participate in the activity by following your toddler’s lead as he chooses paint colors, swirls the spatula around, and shares stories about his creation. 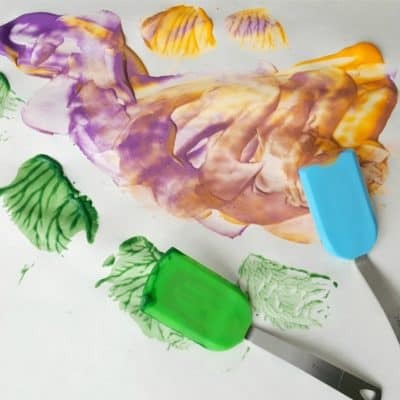 Give toddlers some paint and paper, along with some fun tools like these kid-sized spatulas, and watch the creative energy flow. If you enjoyed this activity you will love our other ways to paint without a paintbrush.